One of my favorite things to do with my free time is to go to the library and get lost in the stacks of cookbooks. I pull books on classic techniques, French bistro food, chocolate and baking and create my own culinary world. Unfortunately, for the past year and a half, our local library moved to a small and temporary location in order to renovate and improve the original building. Getting lost in the stacks of cookbooks wasn't an option. Yesterday, however, was the grand re-opening of the new and improved library. Yeah! To celebrate I thought I would put this appetizer recipe on our Sunday dinner menu. I found this recipe a few years ago while getting lost in the stacks. It was in the book Mediterranean Summer by David Shalleck. It is about an American chef that spends an idyllic summer cooking for a wealthy couple aboard their yacht while sailing through the Côte d'Azur--a great read. This recipe he developed was a favorite that summer and I have to say it is now a favorite of ours. 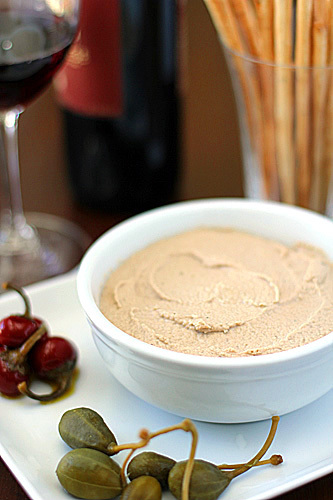 Spuma di Tonno, or tuna mousse, is super simple to prepare and has an incredible taste. You won't believe how quickly this disappears. I have even converted some non tuna likers with this spread. I serve it with Rosemary Grissini, but it is equally delicious on crostini or on thin slices of baguette for a passable hors d'oeurve. I do hope you give it a try. In the bowl of a food processor, add the tuna and pulse to break up the pieces. Add the lemon juice, soy sauce, balsamic vinegar, and butter and puree. Scrape down the sides of the bowl and season with salt and pepper. Add the crème fraîche and puree the mixture until smooth. Transfer to a serving bowl and serve at room temperature. Can be kept in an airtight container in the refrigerator for 3 days. Allow to set at room temperature for about 30 minutes before serving. Enjoy! I love a good tuna recipe and am fond of Italian food. Thanks for sharing this. It sounds delicious and easy to make. This is one of Dad's favorite appetizers that you fix. You're right...it disappears very quickly. Most are surprised when you tell them that it is tuna. Another winner.Great blog! This sounds delicious! I've recently become really into seafood-y spreads. I've been buying them mostly at the supermarkets, but the recipe sounds easy enough! This may be your best picture yet! Thank you. It is delicious. Thank you. It is hard taking a picture of flat beige food. I look forward to revisiting! And I like the shout out to the new library. I too can't wait to get lost in the stacks. Saw you off foodgawker. This spread looks awesome! Thanks for sharing! ok so i'm browsing your archives :) can i get your broccoli recipe? 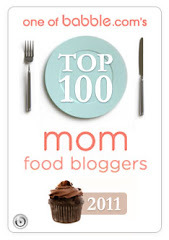 desperately looking for veggie recipes!! I don't really have a recipe for that one. Maybe its time I did:) I blanch the broccolini first, then plunge into an ice bath. For the gremolata, I finely mince a few garlic cloves and mix in a bowl with the zest of a lemon, a few tablespoons of fresh flat-leaf parsley, salt and pepper, We ready to serve, I heat a couple tablespoons in a large skillet, sauté the broccolini to warm through and add the gremolata mixture tossing to coat.